I certainly glean all the wild berries I can get. Then one friend who grows melons commercially lets me take the flats at the end of the season. mostly blueberries, though I do know quite a few edible local plants. Yes and Merry Christmas littlek ! Blueberries are a no. one anti carcinogen too ! Maybe the best. They are great little things! Happy holidays to you, too! This is a good question - I'll have to think about this. 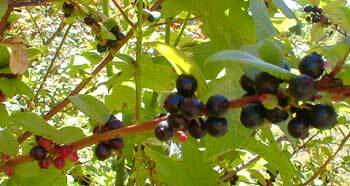 I haven't ever found a patch of those huckleberries...thanx. Choke Cherries are also one of my favorites. I've been known to nibble on the occasional lambsquarters, though. Might even pluck some for salads next spring. Luckily I collected acorns and pine cones to decorate my Christmas Table this year. Also to all A Very Merry Christmas of thoughtfull motivation towards a more harmonious world. Mushrooms, walnuts, hazelnuts, hickory nuts, wild grape, huckleberry, blueberry (plus we grow some), wild strawberry, chokeberry, currants, blackberry, raspberry, many wild greens (some are classified as weeds) plus various herbs (everything from thyme to sweet woodruff), sumac (not the poisonous kind obviously, the red berries make a lemonade drink) ramps, trout, bass, catfish, and wild turkey. You can eat cattails, but I don't care for them. When I lived near the ocean as a child it was a feast of fish, clams, mussels and crabs. tomorrow it will be something else. Life itself! Just think if nature got mad at us! That is truely a wonderfull bounty of nature. Delicious stuff too! Today I gleaned a snow man from Nature. Nice list Green Witch ! wow. I'm always on the lookout for new things to eat. Chokecherries, wild cranberries, wild strawberries, morels, pine needles for tea, greens, crab apples, baby ferns (fry em up in butter), dandelions for root-drink and the greens and for dandelion wine!. Also, I've gleaned off of farmer's crops - sunflower heads, taters, corn, produce of all kinds and herbs, and fruit.....ssshhh! Thanks Algis, I once taught a workshop on wild edibles, but people were so careless about what they would put in their mouth that I thought I might be sued. The one thing I found not worth the effort is acorn flour. It was a long tedious process and in the end, out from buckets & buckets of acorns, we got about a cup of flour. We kept it in a jar on a shelf and worshipped it for years, it took too long to make to just eat it. Yeah I ate acorns in Maine while growing up. YUCKy YUCK YUCK.These days I am growing acorn on my little toe. Boy does it hurt when I knock it. My great uncle visited after xmas and told a story about my Italian great grandmother - she used to wander around her neighborhood in CT and pick mushrooms which she would bring home for dinner. Her daughter and son-in-law wouldn't let their kids eat them. But, gr grandma did. And, she never got sick from them. My mother said they always smelled so good while she was cooking them up that she was always sad she couldn't eat them too. Thats the smallest room in the world....the Mushroom. My friends are picking them too all around southern quebec. Quie a variety too. Thanks for sharing littleK.